Roosterfish are beautiful in an exotic primordial kind of way, and they live in spectacular habitats full of aqua colored water over white sand and boulder covered bottoms surrounded waves often crashing against stark jagged cliffs. Both the air and water are warm where roosterfish live, which is from the Sea of Cortez to Peru. They like the shallow edge water; beaches, cliffs, rocks and bays. They range from palm size to over 100-pounds. They are fast, strong, ruthless and brawley, and they will eat flies. Roosterfish can be more stupid than bluegills when they are young, or maddeningly perceptive when they are trophy size. They are always on the move. Precision casting skills are needed. Long cast are often required. Site fishing is the rule. Good eye sight and polarized glasses are assets. Focus, steady nerves, and the ability to to comprehend a fast changing playing field are crucial for success on big fish. 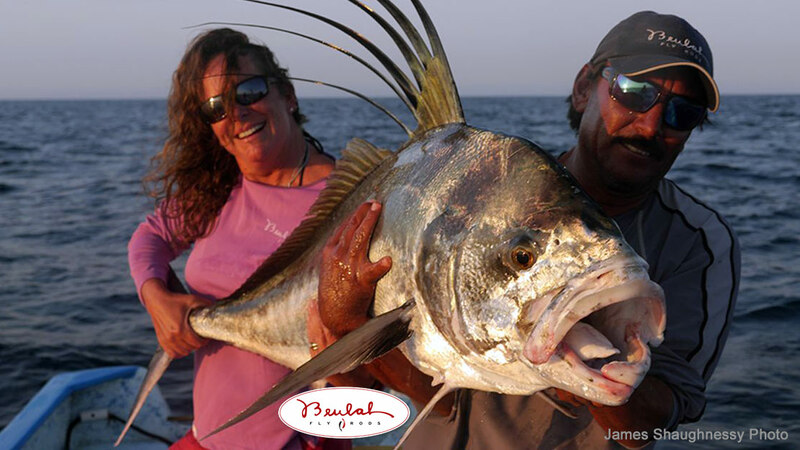 Roosterfish feed on a variety of bait fish that inhabit shallower water along shorelines. A variety of juvenile and adult bait fish in habit the shallow edge water of the Sea of Cortez and the Eastern Pacific Ocean. These shallow water are the nursery for many species. Sardines, Anchovies, Mullet, and Ladyfish are all grist for the Roosterfish mill. These shallows are also the nurseries for Roosterfish, which are first noticed when human hand sized. They will still be located here when they are fully adult. 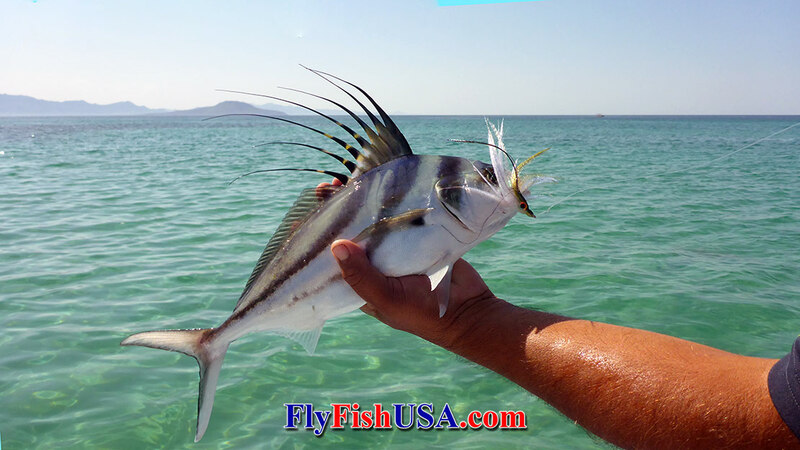 During their lives Roosterfish feed on a lot of different sizes of bait. Tiny Roosters have to concentrate on small bait, and 100-pound Roosterfish can eat Mullets and Ladyfish that are a foot and a half long. However, be aware that we have observed giant Roosters feeding on tiny bait as well. At times any size of Roosterfish can be maddeningly selective, And your fly assortments might include flies ranging from less than 1-inch to the largest you can cast. 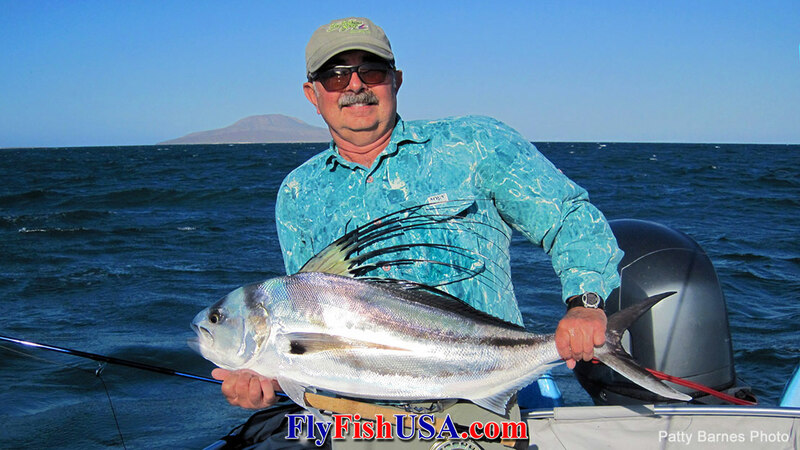 Fly tackle for Roosterfish can be widely varied, because these fish come in a wide variety of sizes in the same habitat. 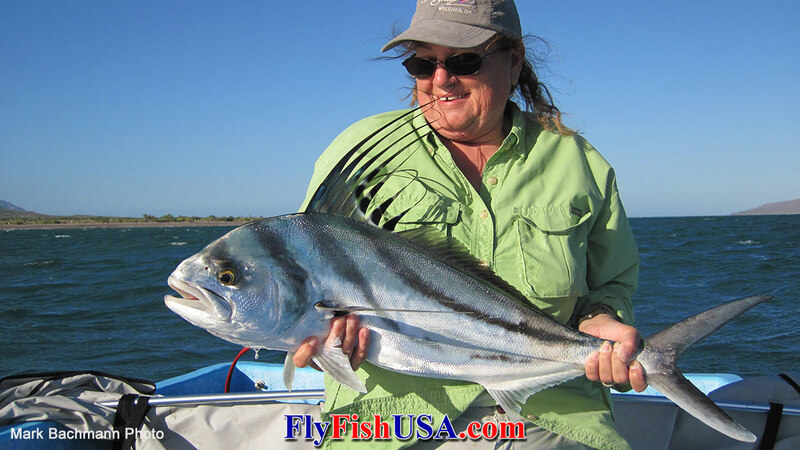 I like to be prepared for grande size Roosterfish at all times, so my rods are medium-fast action 11-weight (12-weight rods are not too heavy for fish over 30-pounds, and no fly rods are really too heavy for monsters over 50-pounds). I use the same setups for Roosterfish as I do for Dorado. My two current favorite Roosterfish rods are my: Beulah Opal and Loop Cross S1 SW MF. As far as fly lines go, I haven't found anything that compares to the RIO Tropical Outbound Short Floating/Intermediate. This line is stealthy, loads a rod easlist for casts of all distances and has the ability to turn over large flies. When it comes to turning over large flies, nothing beats cubic-grains in the line tip. My leaders are made from Frog Hair Fluorocarbon and are simple in construction: 48"-.024, 12"-.019", 18"-.015", 12"-.019" for a total of 7,5'. So far .019" has proven to be adequate as bight tippet. I did have one big Rooster chew through my .015' fluorocarbon.